More than 46 years after he died, Chief Master Sergeant Arden Keith Hassenger was finally placed in his last resting place Friday at the Lebanon IOOF Cemetery. On Dec. 24, 1965, Hassenger and five other U.S. airmen flew out on a secret mission to break up activity on the Ho Chi Minh Trail. Their plane never returned. 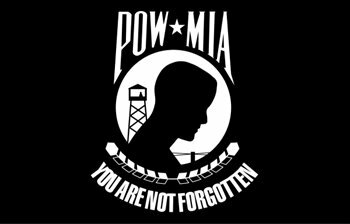 Hassenger was declared missing in action (MIA) until 1977, when over the objections of his wife, Sherrie, the military formerly declared him killed in action and had a memorial service. The family kept pursuing confirmation of Hassenger’s status until this year, when the Air Force said it officially documented the remains of the 29-year-old tailgunner and returned them to his family. CMS Hassenger’s daughter Robin Hobson. 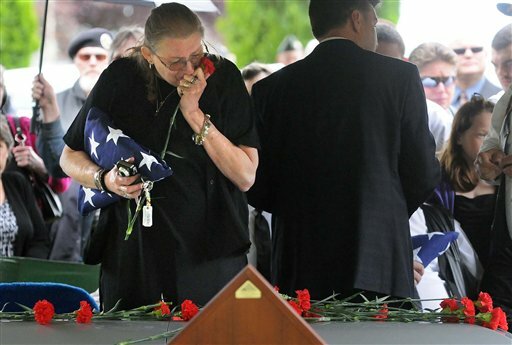 The graveside service was held at the Lebanon IOOF cemetery, and Hassenger was honored with a full military service including an Air Force detail from McChord Air Force Base and a fly-over of two F-15s. Roughly 100 people attended the service, which was led by the Air Force. In attendance were the Patriot Guard Riders and the “40 Et 8”. For Hassenger’s family, it was closure after many years of not knowing for certain whether he was alive or dead. It’s not over until the last is home. This entry was posted on Saturday, June 9th, 2012 at 07:31 and is filed under The Constitutional Watch, The Media, The Second Amendment To The Constitution Of The United States..	You can follow any responses to this entry through the RSS 2.0 feed. You can leave a response, or trackback from your own site.